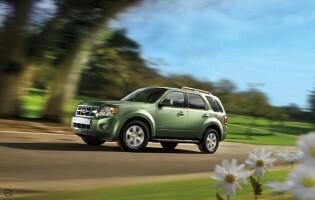 The big knock against SUVs has always been their fuel-guzzling disregard for the environment. That could definitely be on the way to changing with the appearance of more and more hybrid SUVs. Hybrid technology seems to be spreading like wildfire. It may not be long before we begin to see this technology utilized as an option on all vehicle makes and models. For now, we can simply say that the choice is limited, but growing. As we look forward to the day when all vehicles are both efficient and environmentally friendly, we take the time to research the best automotive testing at Car and Driver, Consumer Reports, Edmunds, and Motor Trend to bring you the best hybrid SUVs of today, the 2011 model year. The Mariner Hybrid is all about fuel efficiency with its 2.5L four-cylinder engine and electric motor combining for 177 horsepower and an estimated 34/31 mpg (city/highway). The AWD version brings those numbers down to 30/27 mpg, but will improve the acceleration and traction. The cabin provides a functional area, if not pleasant, thanks to its center console and huge storage bins. The lack of a telescoping steering wheel is a drawback for the driver, but adding the leather upholstery makes the seats comfortable and gives them a luxurious glossy sheen. The 66 cubic feet of maximum cargo space is also impressive, given the Mariner’s compact look and feel. The 6.0L V8 is one of the largest engines coupled into a hybrid system you’ll find. 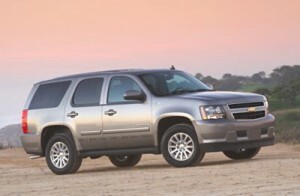 Together with the 60-kilowatt electric motor, the Tahoe can pump out 332 ponies and 367 lb-ft. of torque. The 2WD version can reach a max towing capacity of 6,200 pounds, but the 4WD version brings that number down to 6,000 pounds. The rear-wheel model will get an estimated 21/22 mpg at the pump, and it can reach up to 30 mph on just the electric motor, though it does take a while. The max cargo capacity of 109 cubic feet is the most you’ll find of any hybrid vehicle currently available. Despite its power and space, this one is a little pricy for the acceleration and handling issues it possesses. The M-Class hybrid isn’t short on power with its 3.5L V6 and a pair of electric motors pushing force through an advanced transmission that has both fixed and continuously variable ratios. Together they can give the M-Class an impressive 335 horses and 381 lb-ft. of torque. What it possesses in power, however, it makes up for with a mediocre amount of cargo capacity at 29 cubic feet with rear seats in place. That can expand to 72 cubes when they’re folded flat, but that does lower passenger capacity to two. Still, the cabin is the most luxurious you’ll find in any hybrid, with top-tier materials and construction as well as an array of gadgets and amenities to choose from. With a very modest price tag for a hybrid SUV, and matching the 34/31 mpg fuel efficiency of the Mariner, the Escape remains the most economical choice for a hybrid SUV available. Storage space is modest, but not unimpressive, at 66 cubic feet. The cabin is relatively roomy and seating is comfortable for shorter journeys; the lack of reclining and adjustable rear seats can make long journeys burdensome for passengers. The navigation system, Ford’s Sync system, and the addition of Sirius’s Travel Link service are all equally handy options to have on this one.